The wood materials available today are ideal for making your own accessory trunk and they are available in thicknesses of 1/4 to 3/4 inch. Cabinet grade plywood is available with up to nine layers of thickness using a number of South American hardwoods that remain stable long after being assembled. This grade of wood should not be confused or substituted with less capable versions available at home centers or general lumber supply stores. Three layer versions will likely bend and warp over time and will only yield disappointing results. Find and insist on purchasing the right material. Hardwood pieces that are 1/4-1/2 thick work well for adding strength and structure to important areas like hinge and overlapping joints. 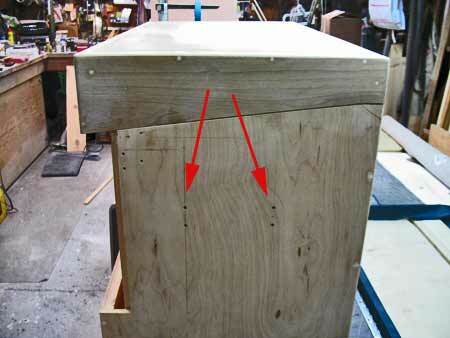 Professional grade material along with modern fastening techniques such as biscuit joints, dowels, small wood screws, and epoxies make assembling a trunk quite easy and durable. 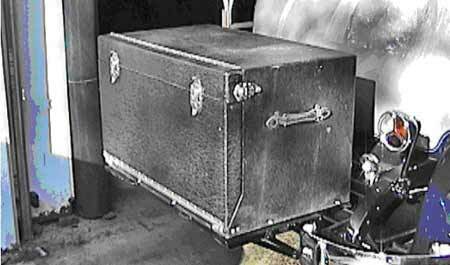 The "box style" trunk shown in photo 18 (courtesy of another Lincoln collector) is an original trunk used by Lincoln on their model L series, spanning from around 1924 to the end of 1930. Using the photo and some known dimensions, the size and design was established at 34 inches wide, 19-1/2 inches deep and 21 inches high. Other design features included a hinged lid and front panel where the lid overlaps the front panel, two non-locking hasps one on each side and a pair of locking hasps in front. This led to the design shown at Photo 19 where two stainless steel piano hinges located on the front and the lid's rear. Each was drilled for 18 sets of mounting holes, just as the original. Other details of the design are the overlapping edges of the front lid, the tapered lower section of the front lid to help with water run-off, simple 1/4 inch rounded edges, and optional vent channels in the rear. 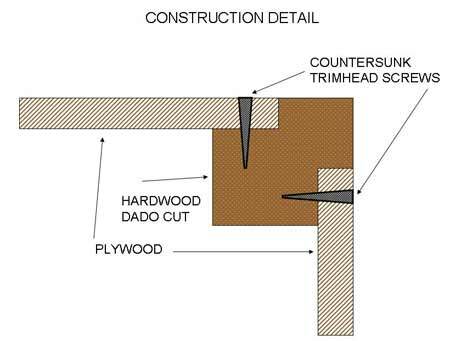 The design uses custom dado cut hard woods in important locations such as where hinges get attached, illustrated in Photo 20. Photo 19 — Concept drawing of our project trunk. The design includes the front panel folding down, the offset height to fold over the lip on the rack, and the lid is one piece with the piano hinge located in the rear. Photo 20 — Cross section illustration of the front edge on the lid. 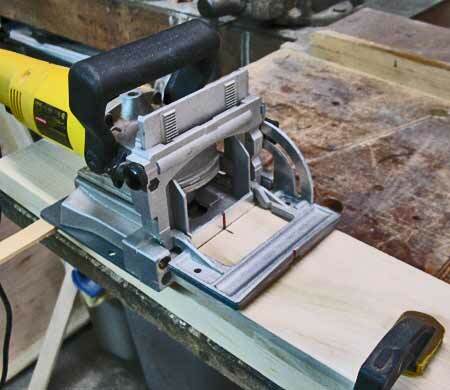 Hardwood is specially cut to accept the cabinet grade plywood. Screws are countersunk, filled in, and sanded smooth. Photo 21 — We used 3/4 inch thick plywood for the base and 1/2 inch thick for all other surfaces. Shown is a hardwood strip glued in place on the rear edge. Note the extra hardwood under the clamp to prevent marring the wood surface. 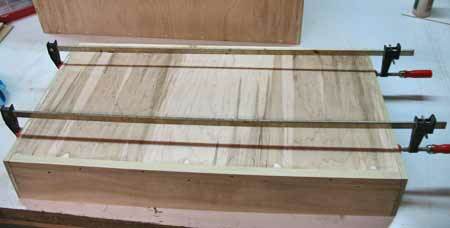 The hardwood strip will be used to secure the rear piano hinge. 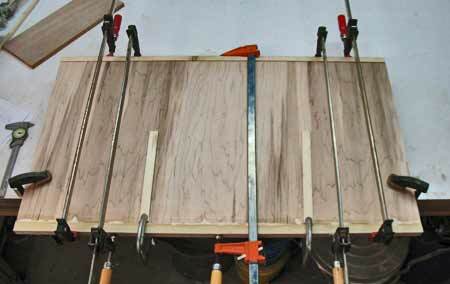 Photo 22 — To minimize movement of the plywood on the hardwood pieces, biscuits are cut and glued in place. Here a biscuit cutter is aligned onto the hardwood. Photo 23 — Close up view of a biscuit inserted into a groove. Photo 24 — Long bar clamps are used during construction to firmly hold pieces together while the glue dries. Positioning of the front and rear hardwood pieces is critical since they will later be used to fasten the side hardwood pieces. Photo 25 — Here biscuits are located on the edges of the lid. 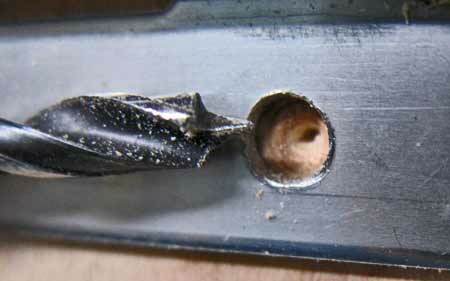 Photo 26 — Small flat head screws are countersunk into wood surfaces. The use of square drive hardware ensures secure joints. They can be filled in later. Photo 27 — Long bar clamps are used during construction to firmly hold the side pieces while they are screwed together and the glue dries. Photo 28 — Flat head screws are used in addition to the glue. Note they are located where there is not a biscuit. The X marks the position of the biscuit joints. 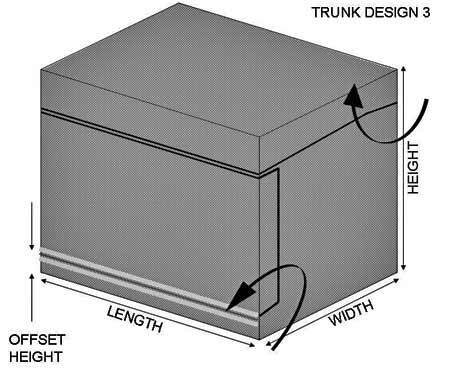 Now that the trunk is partially built, this is a good time to finalize how you will fasten your trunk to the rack. This project strategically placed four Tee style blind nuts into the base (Photos 29 & 30). Later two metal bars will secure the trunk into these blind nuts. In this case the side dimensions were not that important, but the front to rear placement was critical as to not interfere with the existing rack. One goal in our trunk project was to not drill any holes in the original rack, and use extra metal hardware to sandwich the trunk to the rack (Photo 68). Each trunk project is different and your situation may require that you choose a fastening method that best suits your rack for both strength and esthetics. Photo 29 — The design of this project trunk has it fastened to the rack from underneath. Here four blind nuts are inserted into the 3/4 inch base. Photo 30 — Close up view of the blind nut in Photo 29. Many styles of blind hardware are available. This one has a lip and countersunk into the base. It was planned to be covered later by a thin precovered wood layer, so filling it in was not necessary but you need to use proper length bolts so that they do not protrude and interfer with the installation of interior panel. 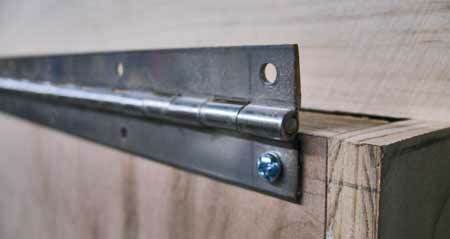 One technique to fasten all hinges and functioning hasp and alignment hardware to your trunk is to use threaded rivets. For more information see How to Use Threaded Rivets. This involves setting a threaded brass insert (available from the local hobby shop or Microfasteners) into the wood for each threaded rivet. This provides the most invisible means versus using nuts on the inside. 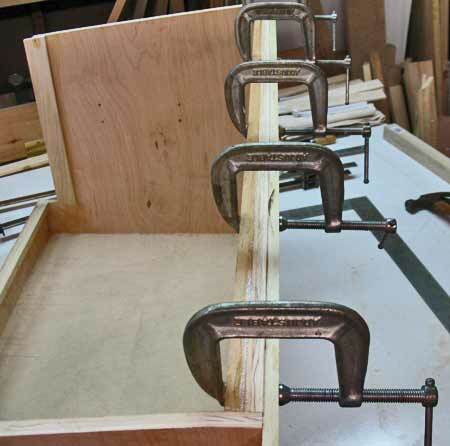 While this may seem rather tedious and it did involve setting more than sixty inserts for this Lincoln trunk, the use of a drill-driver and a threaded mandrel (shown in the reference article) made the job much easier than it sounds. Inserts can be applied at about one per minute with a little experience. 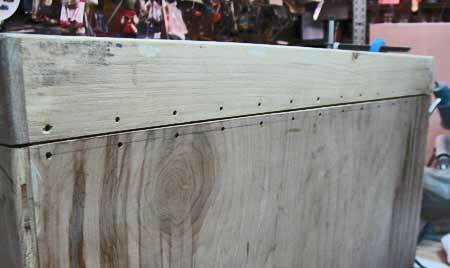 The results of using threaded rivets are far more durable than simple nails. Carefully select the head styles for your project when ordering from either Tioga Stainless, Totally Stainless or Restoration Supply. The piano hinges look better with 6-32 truss head rivets while round head version are more appealing to hasp and other hardware. 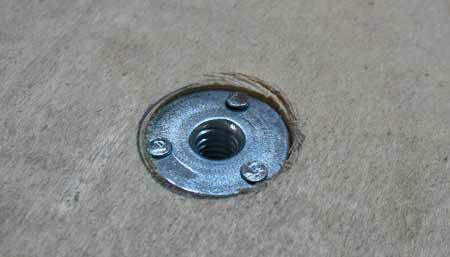 Simple machine screws can be used for fitting purposes until you're ready to install the threaded rivets. Regular domed head nails from Frank Chervan can be used for simpler decorative hardware if you choose. Take note when screwing in the brass inserts that the cut side goes in first. 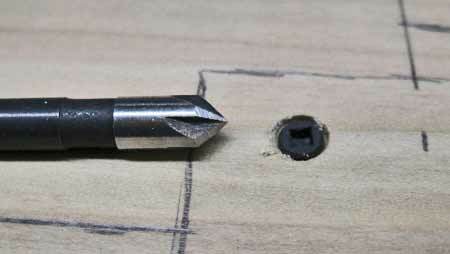 Some have been tempted to use the cut side for a regular flat blade screw driver which is wrong. 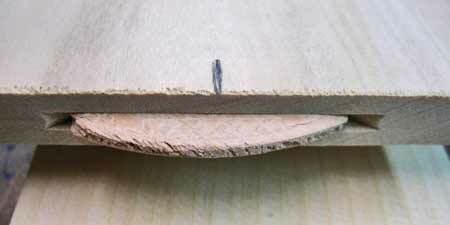 The cut side actually cuts threads into the wood and helps secure it when backing the mandrel out. Hint: when applying the inserts using the drill-driver and a mandrel to the desired depth, quickly reverse the driver and the threaded insert will usually stay in place. On occasion, a threaded insert may get jammed on the mandrel's shoulder and when this happens, the insert may twist out. Gently reapply into the hole and if necessary apply a few drops of Kwik Poly into the hole to secure it into the wood. Don't apply too much that would get onto the machine threads. The concept of using threaded rivets and inserts may sound like a big chore, but the finished results are outstanding. These are the "details" everyone talks about on first-class restorations and the results are superior to using screws or nails. 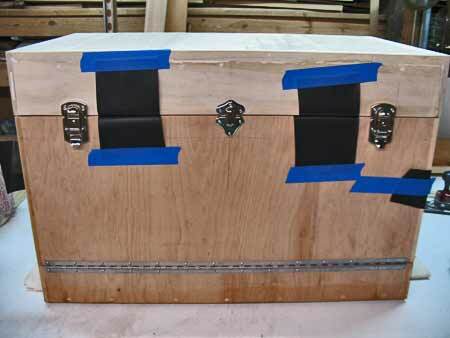 Isn't it worth spending an extra 2-3 hours to make a long-lasting accessory trunk that will stand up to the test of time? Photo 31 — To facilitate good fit for the locking hasps and of the alignment hardware (middle), several pieces of the covering material are taped to the lid and front panel and wrapped over the mating surfaces so that you can account for the thickness of the material when locating the hardware. They provide the necessary spacing for fitting the hardware which must be done now to properly locate the threaded inserts. Photo 32 — Locating hardware is critical to a good final trunk project. Hasps such as this must pull the panels together. 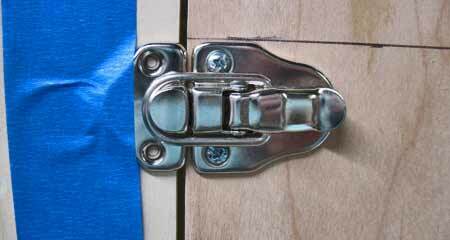 Too loose and the hasp can fly open and too tight the hasp can break or apply too much pressure on the covering material. Here the base of the hasp is attached first and the hook side is temporarily held with tape while the panels are checked for fit. A good sharp pencil clearly marks the location for the holes. Photo 33 — The piano hinge is predrilled with the desired spacing for the threaded rivets. 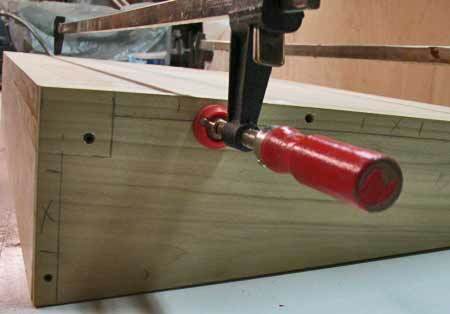 The piano hinge on the front panel is temporarily held in with machine screws at the ends. Photo 34 — A brad point drill is used to locate the center for each brass threaded insert. Once the centers for all 36 holes have been located, use the brad point drill of appropriate size to fully drill the holes. 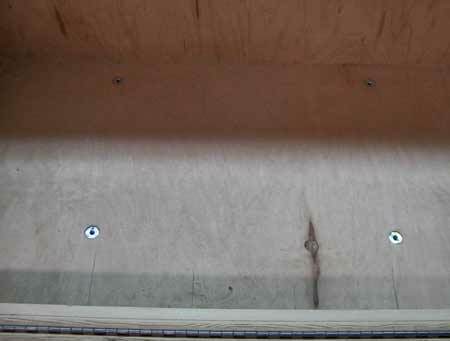 Photo 35 — Countersunk holes are filled in with Kwik Poly. The Kwik Poly mix used Durham's wood putty as a filling agent which does not shrink and sands easily. Photo 36 — A special mandrel connected to a drill driver is used to quickly insert the brass threaded inserts. Note the use of a mark on the mandrel to establish the set depth and note the cut end of the insert goes in first (to cut the wood threads. The cut end is not for a regular blade screwdriver. Photo 37 — Overall view of the box so far. 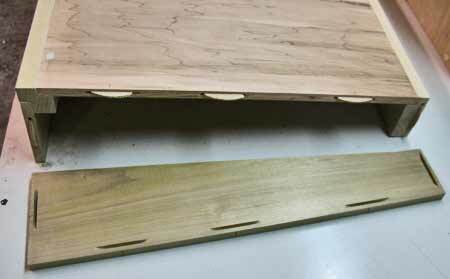 Note the hinge holes in the rear wood strip and 1/4 X 2 inch hard wood strips have been glued in place on the top and front edges (the edges where the front panel and lid will mate to the base). 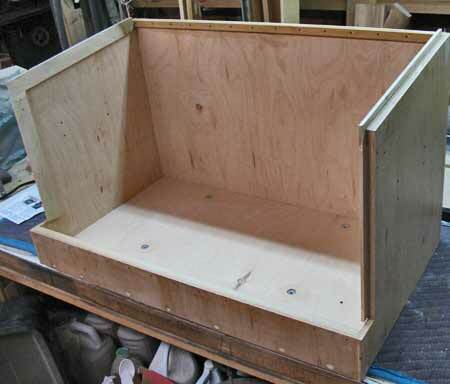 Photo 38 — Rear view of our project trunk with the lid resting in place. All 36 holes have been drilled and now ready for the threaded inserts. Photo 39 — Side view of our trunk shows threaded inserts have been installed in the middle area for the side handle loops and the front edge for the hasp base. Now that the trunk is built, this is a good time to apply a sanding sealer. In Part 3 we'll wrap up our Trunk Project with guidelines on covering the trunk.